The coolest labels in the hottest design trend of the year… This school labels pack provides a variety of personalized labels in different sizes perfect for school. Tack ’em on school supplies, gym clothes, backpacks, sneakers, water bottles, uniforms, and more! This pack also comes with two bag tags for backpacks, pencil cases, or gym bags. My Stars! 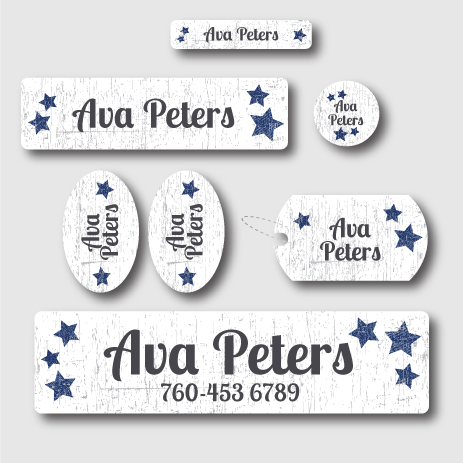 What a beautiful label design in the hottest trend of the year…stars! This pack gives you the perfect variety of name labels for your kids going to school. Enough size and variety of labels for school supplies, gym clothes, backpacks, sneakers, water bottles, uniforms, and more! You’ll also receive two bag tags for backpacks, pencil cases, or gym bags.